Great Fun and a nice trinket for countries you have visited or would like to in the future. 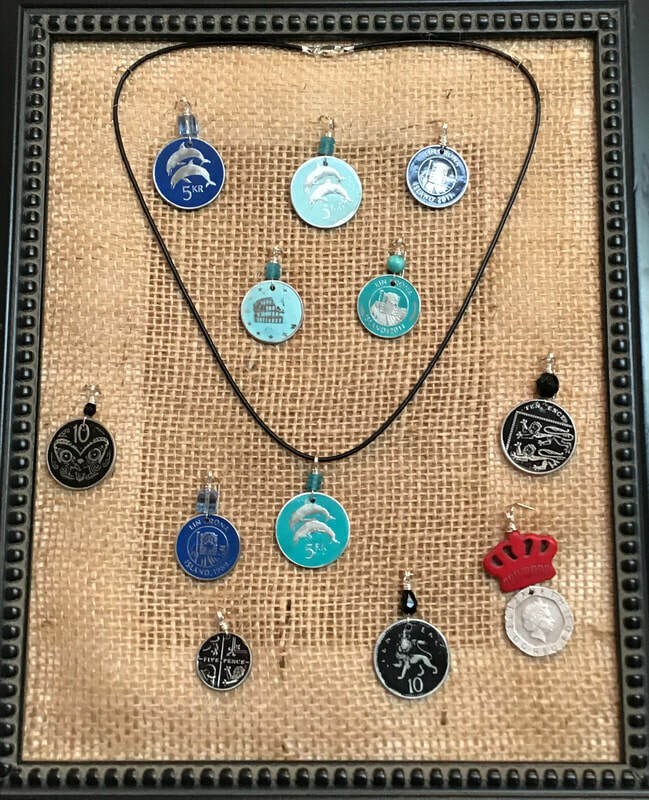 Choose a coin then choose a leather cord necklace in either 16 inch or 18 inch black or dark brown leather with a sterling silver lobster clasp. All coins have been collected on my travels. I use a special paint and then sand the raised surface to highlight the interesting image on the coin and then paint it again with a clear coat. Old English two pence copper coin. both sides of coin shown. 20 inch Copper colored leather cord with copper hook clasp. Dark Blue Euro from Spain with 22 inch metalic copper leather cord with copper hook clasp. New English one penny in burnt orange with 22 inch gold colored leather cord with copper hook clasp. 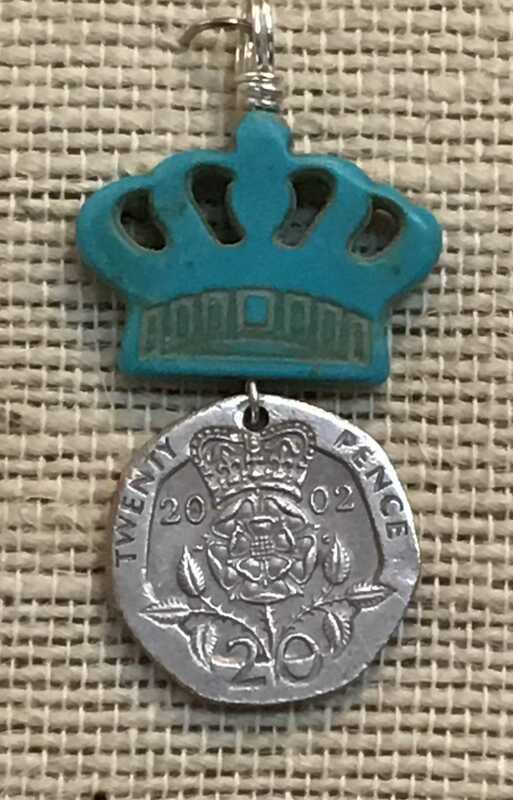 19 1/2" long necklace with natural patina old style British 1 and 2 pence copper penny. Hand made links of green agate and Czech crystals with green opal stone accents. Earrings have the new image 1 copper penny with opal stone and hang 1 1/2" with copper ear wires. 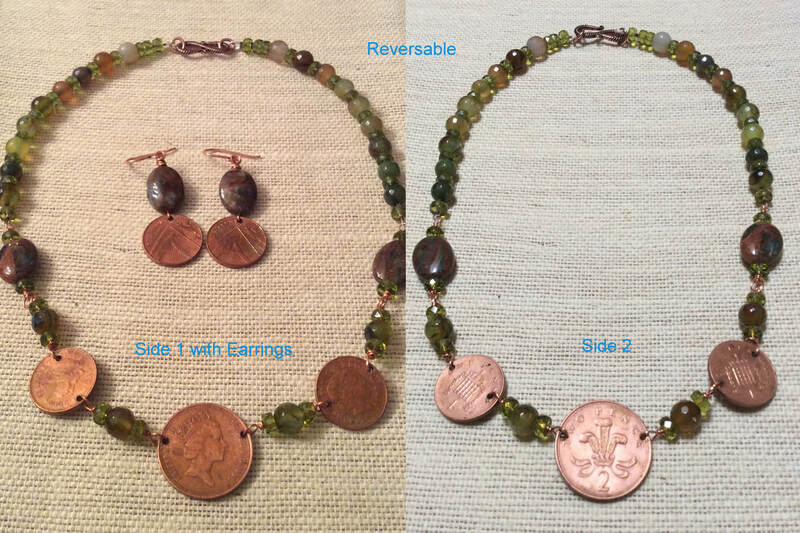 Best of all this necklace is Reversible for 2 great looks. British Two Pence coin with 1993 Queen Elizabeth image with Rhodonite stone necklace. Rhodonite is a Beautiful and not so easy to find stone. I purchased these on a trip to San Diego. The earthy pink tones blend well with copper. Approx. 20" long with stunning large twisted teardrop stones and copper accents Front of coin has elegant image of Queen Elizabeth. Back of the coin has a feather fleur de lis design. 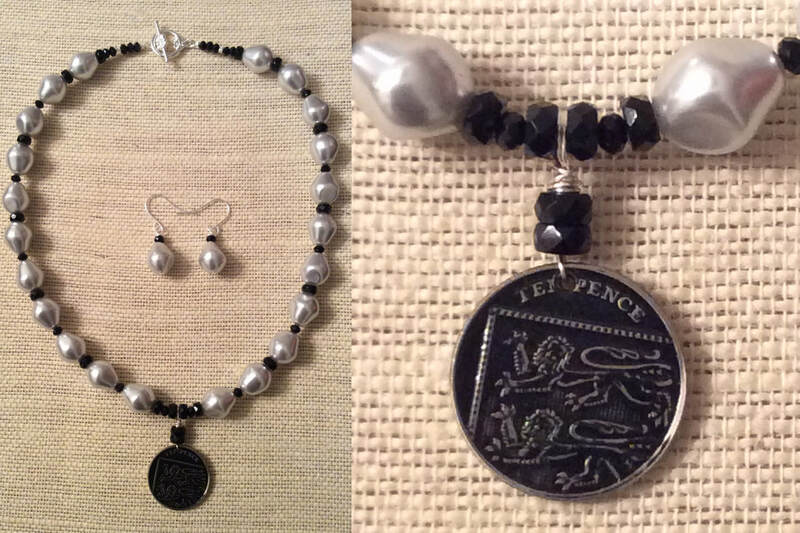 British Two Pence coin with 2001 Queen Elizabeth image with Rhodonite stone necklace. Rhodonite is a Beautiful and not so easy to find stone. I purchased these on a trip to San Diego. The earthy pink tones blend well with copper. Approx. 20" long with stunning large twisted teardrop stones and copper accents Front of coin has the current image of Queen Elizabeth. Back of the coin (shown here) has a feather fleur de lis design. Copper Japanese Yen Coin with natural patina. Turquoise green Czech Picasso Twist and small Czech salmon brick Beads with Copper accents on a 20" copper heart chain. 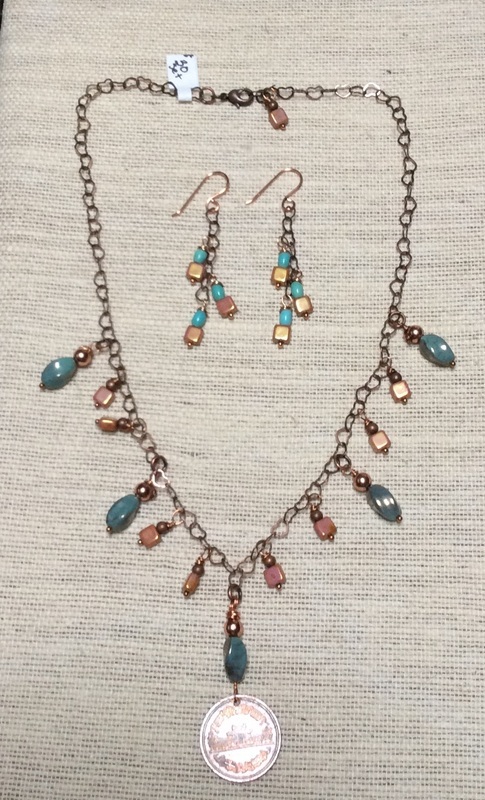 Earrings included as a set. Blue African Dumortierite large teardrop pendant (#1) with Blue 100 yen Japanese Coin and angelite quartz accents on a silver plated chain with toggle clasp. Approx. 33" long. Blue African Dumortierite large teardrop pendant (#2) with Blue 100 yen Japanese Coin and angelite & blueberry quartz accents on a silver plated chain with toggle clasp. Approx. 33" long. 18" long with coin pendant hanging 1 1/2". Hand Painted new British 10 pence coin in black. Reverse side is silver image of Queen Elizabeth II. Pear shaped silver glass pearls and black jet crystals. Earrings hang 3/4" on silver plated ear wires. Looks stunning!